There are a lot of subtle indications during the first half of April that really let you know that spring has, well, sprung. You order an iced coffee and suddenly remember that you don’t need a winter glove to hold it anymore. You go to put on a pair of boots and realize that, actually, you can get away with mules. Here in NYC, there’s always that first day of really nice weekend weather when it feels like the whole city has flocked to the park. And, of course, you know it’s really, definitely spring when you look at an item in gingham print and feel like you can finally wear it again. Gingham, one of those rare gems that’s both trendy and classic, has the magical ability to make any item and any outfit feel instantly lighter, more interesting, and, of course, spring-ready. It never fails to delight and never—ever—looks dated. What else makes it amazing? You don’t need to break your budget to buy into it. The easy print is accessible from a range of brands, including our very own Who What Wear collection for Target. 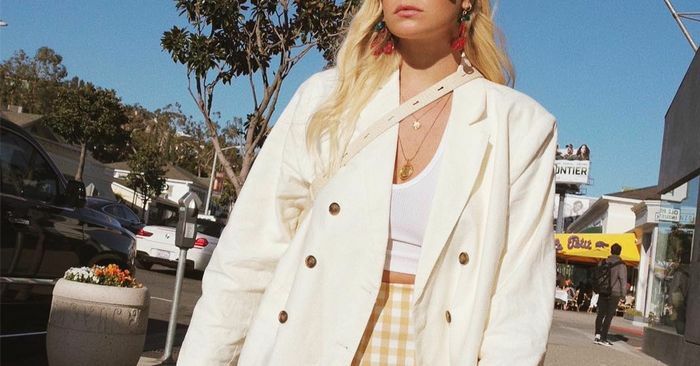 To see how girls are already styling our gingham pieces during these first few weeks of spring and shop them for yourself along the way, just keep scrolling.